COLD SPRING, MN – Third Street Brewhouse (Third Street), is pleased to announce the release of their latest brew, Sanity Break Session IPA. 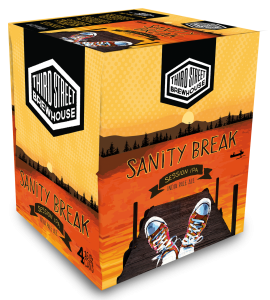 Sanity Break was created with summer time in mind, offering a crisp, clean full hop flavor for easy drinking. With 4.0% alcohol, this session IPA is perfect for a day (or two) of R&R when the daily grind gets old. Third Street brewers have found Sanity Break to go well with roasted or smoked food, including barbeque, burgers and brats, BLT’s and deli sandwiches. You can look for Sanity Break Session IPA at a local retailer near you, featured in 4-pack, 16-oz cans and in the Third Street summer variety pack. Third Street’s tap house is open on Fridays from 4-8pm and Saturdays from 12-5pm.